TGIF! This week has been emotionally difficult for me at work and this week has been dragging for a long time. I have a new boss who has been tasked with the difficult job of reorganizing our office and meeting all the needs of corporate but also balancing the needs of our staff. Unfortunately, it seems like corporate is neglecting the needs of the staff in favor of maximizing productivity. Most of the staff is up in arms over this. In regards to me, I will probably have to start looking for daycare so that I can work 40 hours a week instead of 35 hours despite the difference made up by my vacation hours. Insert sad face here. I was at Walgreens recently and stumbled upon the Sinful Colors Pool Side display. Aside from Rise & Shine and Endless Blue, there were three new colors in to choose from and I decided to pick up Sunburnt, a murky orange with a slight coral tint. 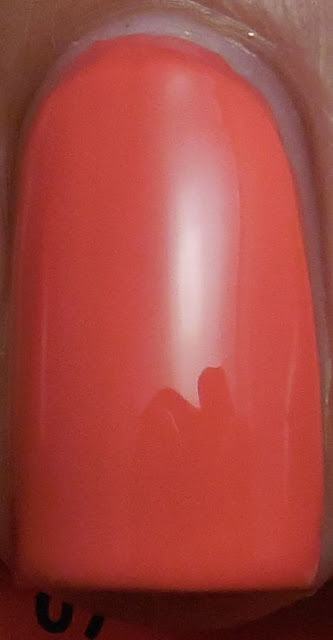 It's right in line with the popular orange and coral shades that are popular this season, and the formula was fairly decent. It glided on slightly thick but it was perfect a two coats. No topcoat in these pics so you can see it's actual finish. I'm really digging orange this season, especially since it's not a color that I normally gravitate towards. I was always worried that it wouldn't look good with my skin tone, but I guess it all depends on the shade. This particular one seems to be a neutral orange, neither cool or warm so I think it's easy for most skin tones to pull off. Have you been using any orange shades this season?